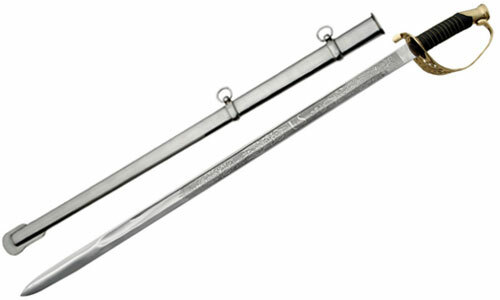 Staff Officer Swords for sale are 39 inches in all. They are inspired by the 1850 Union Staff and Field Officer Sword and feature the letters US formed into the guard and a metal scabbard with hanging loops. The 32 inch unsharpened carbon steel blade is engraved with ornate designs and the abbreviation US. These military sabers have a black leather wrapped handle with an intertwined brass-colored wire wrap. The hand guard is brass colored metal. Buy these Staff Officer Swords for $59.99.